This actually completes an informal trilogy of episodes examining the human condition as affected by war (the previous two were The Defector and The Hunted). These, especially this one and The Hunted, are rather transparent in just reexamining human history - there are no real aliens in these; they are all just other humans, like us. The High Ground, however, deals with terrorism; it's one thing to deal with soldiers and the act of killing other soldiers, even the sometimes questionable rules of war; but, terrorists target civilians and innocents. Therefore, there is a harsh tone to this one from the get-go; there's no way around it. In one scene, it's mentioned how the terrorists exploded a monorail full of kids; it's also mentioned that this was a mistake, that the intended target was a police vehicle. I'm not sure why this was mentioned; either the terrorists make horrible mistakes or they are also liars. 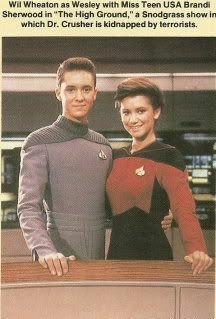 It sounded like an attempt to humanize them a bit and it shows an expected weakness of TV scripts - back then, at least. There's only so far it could go with such subjects and you end up with a sanitized depiction of such terrible activity, even if it's hard-hitting by TV standards. So, you get a lot of debate, comparing present-day terrorists to such historic fighters as George Washington and his troops and that such terms as 'terrorists' and 'freedom fighters' are determined by who wins & loses in history. And, there are questions on when such violent activity becomes justified; and, there's even a suggestion (all by Data, of course) that such violent options have been successful in the past (it's worth noting that two examples which Data brings up take place in the near-future from our perspective and 'haven't happened yet' - i.e. these are fabrications). Roddenberry, of course, used TOS and now TNG as platforms for social/political commentary but this has the feel of a 6th-grade class, which is always a problem with TNG when Data begins to inquire with his childlike curiosity. 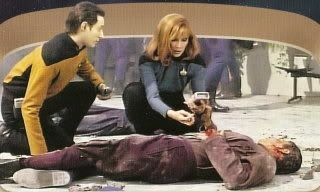 In the plot, the terrorists abduct Dr. Crusher during an attack in a public square; the leader of the terrorists wants her to look at some dying comrades. These terrorists use 'dimensional shifting' technology - like the transporter - to pop in & out of places, but this tech has detrimental effects on the human body. 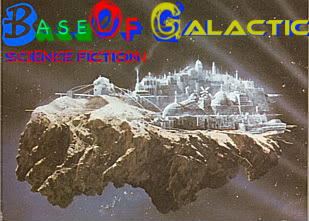 The terrorists also have a beef with the Federation, because ships like the Enterprise bring medical supplies to the establishment of this planet. 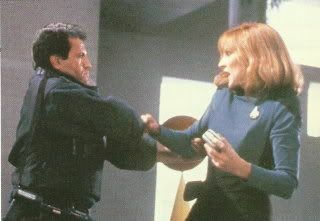 Riker teams with the local top cop (Kerrie Keane) to find Crusher. 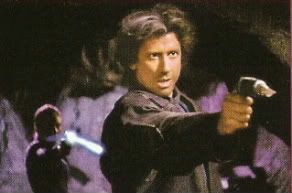 In an admittedly tense sequence involving crew casualties, the terrorists target the ship with an explosive. 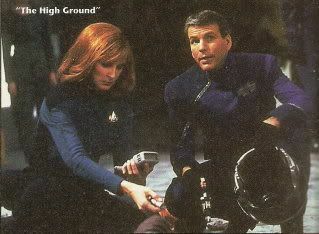 They also manage to make off with Picard.